I first met Ginara in July 2013 when I was in Mabul Island in Sabah. She has one of the most captivating smiles I’ve seen. She was about 8-year-old. She came to us in her little sampan (boat), begging for food, money and clothes. Later I discovered that she’s a Bajau Laut girl. She and her family live in the boathouse about 5km from the guesthouse that I was staying. When I saw how Ginara, her parents and three siblings crammed into that small boathouse (lepa-lepa), I was intrigued and decided to research more on the Bajau Laut people. I discovered that they are one of the last surviving sea nomads in the world. In Malaysia, they are stateless or undocumented and live on subsistence fishing. They are famously known as sea gypsies or sea nomads. They live in small family boats or lepa-lepa in the sea and rely on marine resources for living¹. 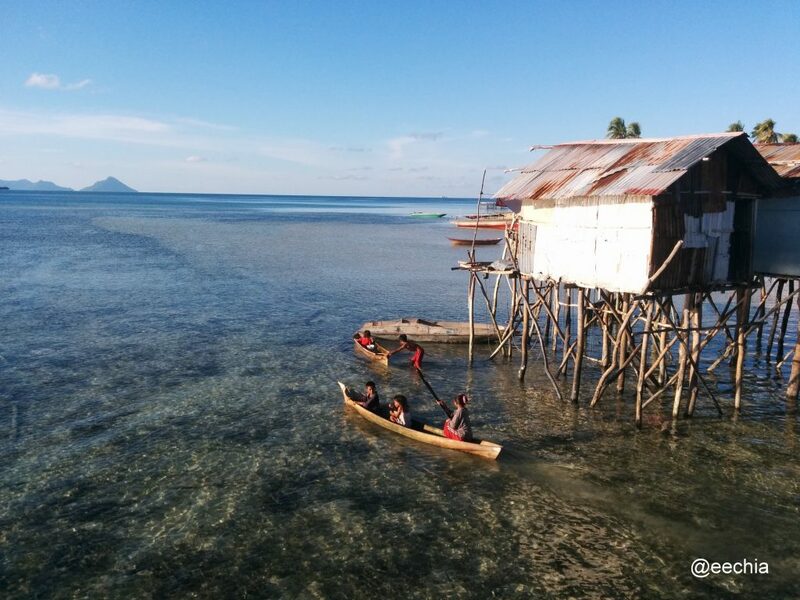 In recent years, others have moved into stilted wooden houses on the sea while still using the lepa-lepa as their primary transport. Both the lepa-lepa and house have no electricity and fresh water. They sell their catch to the local community, seafood restaurants, tourists and fish operators. They are also one of the small-scale suppliers of the luxurious Live Reef Fish Trade (LRFT) in Southeast Asia². They are poor and are often socially marginalised by the general public “for their nomadic seafaring way of life”³. They are called derogatory terms such as pala’au or luwa’an, “meaning, literally, ‘that which is spat or vomited out’”⁴. Their average monthly fishing income is only enough to survive, insufficient for anything beyond necessities⁵. The area that they are living in, where I was in Sabah is part of an area known as The Coral Triangle. The Coral Triangle has more marine species than anywhere else on the planet. It is known as the Amazon of the Sea. The Coral Triangle also covers the water of five other countries: Indonesia, the Philippines, Papua New Guinea, Timor-Leste and the Solomon Islands. The Coral Triangle is the global centre for marine biodiversity. Why are the sea-nomads in Sabah? Their history is a complicated one. Some of them have been around the islands of Semporna before the formation of Malaysia. While some are the descendants of evacuees who fled the Sulu armed conflict and political instability in Southern Mindanao, the Philippines in the 1970s to seek refuge in Sabah. Back then the evacuees included other groups of people like the Suluk and Bajau. Being caught in a refugee crisis, Malaysia received humanitarian support and financial aid from the United Nation High Commissioner for Refugees (UNHCR), the International Red Cross and Saudi Arabia. The renowned diving island Pulau Mabul previously known as the UN Island was used to settle the refugees. Now, despite the presence of resort and dive operators and tourists, Pulau Mabul is still inhabited by the refugees (a mix of Suluk, Bajau and Bajau Laut), many of them are undocumented. Hence they can neither be enrolled in school nor work legally in Semporna. Some of them have the IMM13 document issued by the Immigration can study in SK Pulau Mabul and work, but many do not have such opportunities. Historically, the Bajau Laut community is part of the wider Sama-Bajau-speaking people living in Borneo, Sulu Archipelago and Eastern Indonesia. In Sabah, the latter consists of land-based and shore-based peoples⁶. The land-based people are commonly known as Bajau Darat can be found on the West Coast. The shore-based people reside on the East Coast are two different communities: the nomadic/semi-nomadic Bajau Laut which Ginara is from, and the settled/mainland Bajau (Bajau), possibly also known as the Samals (Samales Laut) originated from Sulu⁷. Even though both groups speak a similar language, they are different culturally. The Bajau/Samals are Muslim while the Bajau Laut are pagan, and often assume a more inferior status. Scholars suspect that both descended from the same sea-roving ancestor, but the Samals would reject such hypothesis⁸. 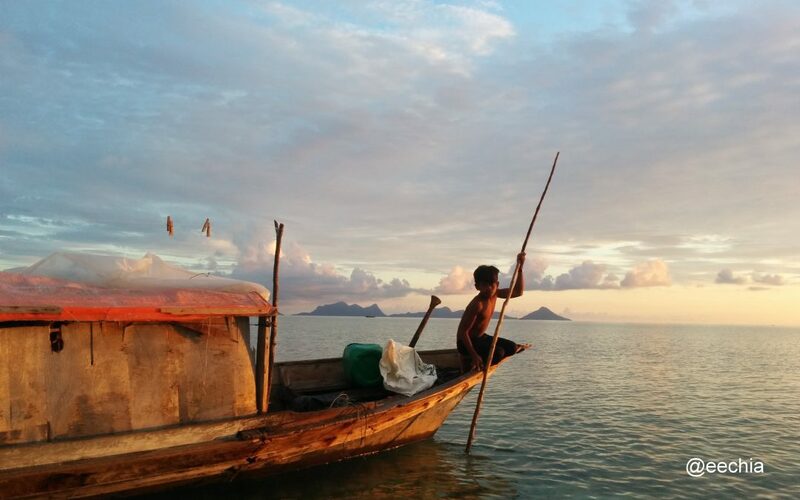 The Bajau identifies themselves according to their island of origin, e.g. Bajau Ubian, Bajau Simunul. Currently, there are two different groups of Bajau Laut in Semporna who identify themselves as Sama diLaut or a’a dilaut. One group has Malaysian citizenship while the other does not. The ones who are citizens have been living in Sabah before 1963 and have are sedentarized. They mostly reside in Kampung Bangau-Bangau, the first Bajau Laut settlement since the sixties. The ones who are considered stateless are the nomadic and semi-nomadic Bajau Laut. Some have been living in Sabah before 1963, many of those are now residing in the Tun Sakaran Marine Park (TSMP). Others came after 1963 during the refugee’s crises like Ginara’s grandparents. Some of them live in marine parks, other islands surrounding TSMP like Pulau Omadal and Pulau Mabul, along the coast of Semporna town. Those who are still living in their lepa-lepa leading a nomadic lifestyle move around between these three places, while some have built their stilt houses, like Ginara’s parents. After my first encounter with Ginara in 2013 in Pulau Mabul, she has followed her parents to Pulau Omadal. She now attends Iskul Sama diLaut Omadal together with her other stateless friends.